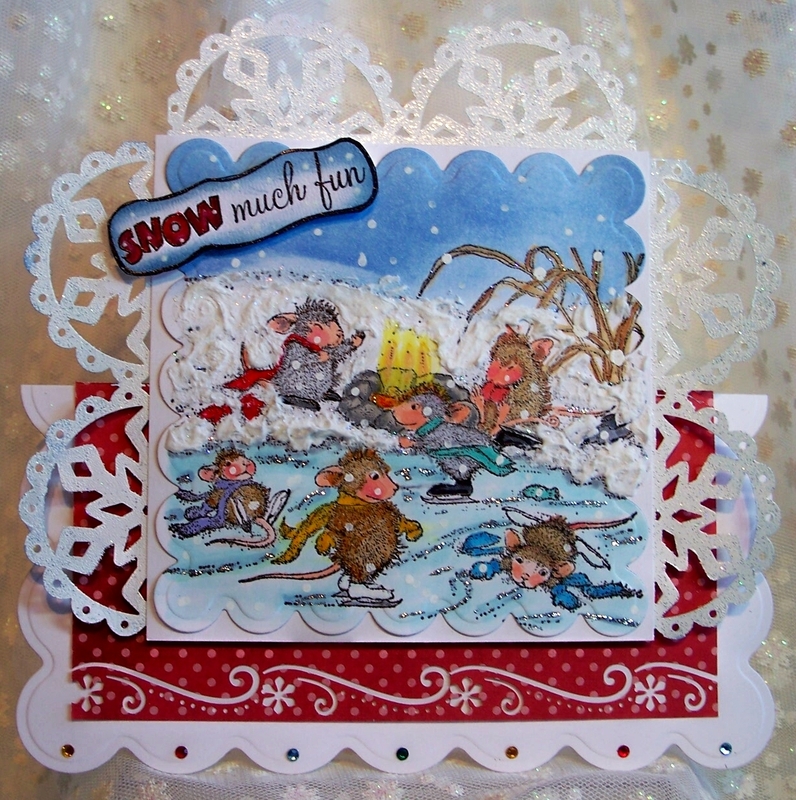 Time for another House Mouse and Friends Monday Challenge. Thanks to those who shared their Baby card creations with us last challenge. offering a $25 Gift Voucher for their online store. Our design team has come up with some great cards/projects for your inspiration, please go to the blog site and check them out. We hope you will join us for our "Let it Snow Challenge, we can't wait to see what you come up with. Don't forget, you must use a House Mouse, Gruffie, or happy hopper image on your entry. I may have to play in this challenge after seeing all the fun DT cards this morning. Your card shape is amazing and magical and that image is too fun. Captures the way we all felt playing in the snow and ice when we were younger - I guess that is why the HM images always seem to warm our hearts. Well done Sue. Hugz! What a fabulous card, Sue. I really have to get that Nordic Snowflake. Wonderful coloring you did on your scene and the pop of red on the card base really draws your eye. Love It. How our baby? thank you for your message. Iam looking for the postman, know!! haha. 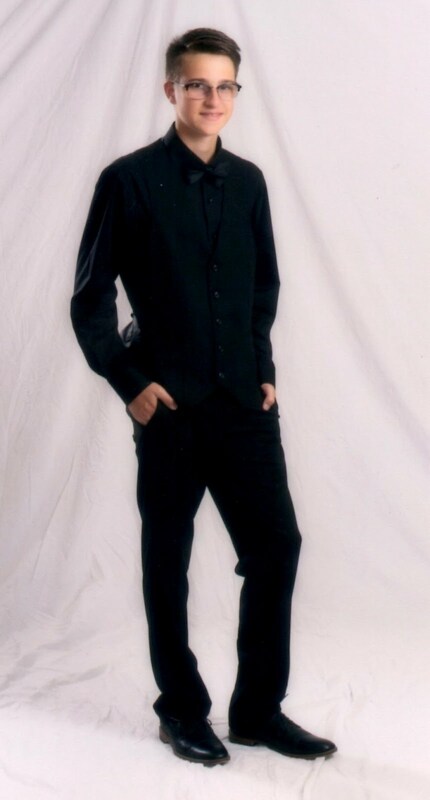 This is beyond gorgeous, Sue! I want to go play with them! You really brought this scene to life. You inspire me so very much. This is gorgeous Sue. I love the fun image and wonderful design. Your colouring is fabulous too. this is a beautiful card Sue. 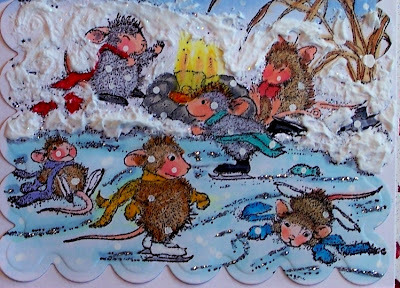 A fabulous card Sue, your design is stunning and a fantastic scene - what busy time having fun those beautifully coloured little mousie have been!!! Wonderful winter scene you are sharing, adorable image and fab colouring. The snowflake die is WOW. This just looks so fantastic Sue and so very creative with all the snow!! Gorgeous card, so much going on with it and everything works so well together, wow, love it! Marvellous creation, love the image, so cute, and the design is fabulous. This is the first time I've seen this HM image, and it's perfect for this challenge! I love all the sparkly detail work, and especially those snowflakes! 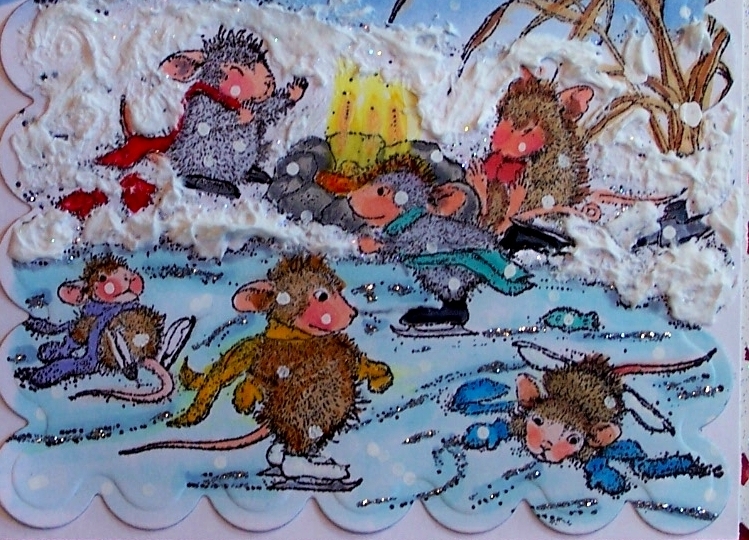 Soon enough we'll be dealing with icy, snowy situations like this too :) Great card! This does look like fun. I always enjoy your house Mouse creations.